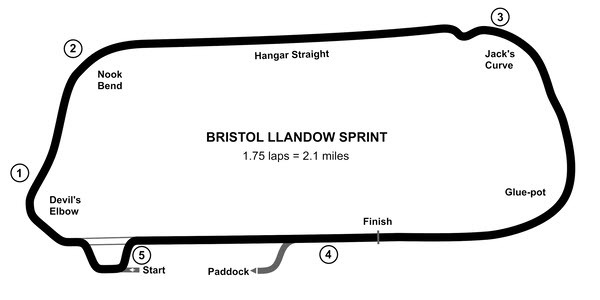 The annual Bristol Llandow Sprint, co-promoted by Bristol Pegasus Motor Club and Bristol Motor Club, will be taking place this year on Saturday 11 May. The tarmac is approximately 9m-wide and the sprint course consists of 1¾-laps of the circuit, making a competitive run of approx. 1.6-miles. Llandow is located 15 miles south west of Cardiff – postcode for SatNav is CF71 7PB, or see the Google map below. Please click this link to download Supplementary Regulations and Entry Form. Update 7 March: The event is now FULL! We are no longer accepting any entries for the Llandow Sprint 2019 as the maximum number of entries and reserves has now been reached. Final Instructions and entry list will be sent out in early May. If you have any questions about the event please email Zoë Tooth, Event Secretary – tooth.zoe@gmail.com. Here is the current list of confirmed entries and reserves for the event. As with any sprint, we need marshals to help run the day safely and efficiently, so if you’re not planning to compete please consider offering your services. For many of the posts you don’t need any prior experience, just enthusiasm, common sense and the willingness to learn the simple rules that apply. For details please contact Chief Marshal Mark Tooth or telephone him on 07813 521339. Results of the last Bristol Llandow Sprint.